My 224 says France as place of manufacturing. It is a brush that really changes my makeup results from what I have been used to. 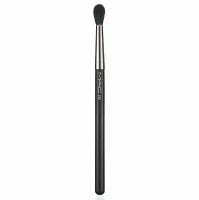 I use it to apply and blend crease colour and to diffuse the colour towards my eyebrows. I FEEL that this brush has great potential, but since I am inexperienced and self-taught I cannot say how good this is. It picks up colour quite well, no unnecessary eyeshadow pickin...read moreg of e/s fallout and it deposits it in the exact spot I want. Then it is easy to blend, The bristles are soft and dense and I had no issues of hair fallout yet. I spot-clean it every now and then, and also wash it from time to time. No problem, no bleeding, no shedding, no splaying (guard always on). I will repurchase if I lost this, but not to have multiples as one is enough for me. All in all necessary but not something thrilling. I really love my 224! This brush often gets over looked because of the 217 (which is my #1 brush). Even though the two brushes look very similar, they apply color very differently. The 224 is great for putting shadow in your crease (if you want something softer than the 217), but my main use is for highlighting under the brows. It applies just enough color that it catches in the sunlight, but I don't look like a drag queen. I've also started using the brush for under eye concealer (I use MACs select cover up) and, in my opinion, works better than a traditional concealer brush because it really gets into your fine lines. I bought this brush to be a blending brush without product. It ended up being my main brush. I have hooded lids, so while I like the 222, it has a smaller radius of adding eyeshadow into my crease and I need the color to go into my crease and above to see it at all. The 224 is perfect for that, but if you have smaller lids and want more precise placement, you might want to look into the 222. I love this brush because I can use it for multiple things, but I love the way that it blends eyeshadow perfectly into my crease!